What's The Best Time of Year to Go Camping? Australia is a country that not only offers great diversity in its landscapes and scenery but also in its weather and seasonal changes. From the tropical climate of Far North Queensland to the Mediterranean environment of South Australia, you are guaranteed something unique each place you go. And sometimes, you might be lucky (or unfortunate) to experience multiple climate changes in one day. There's no doubt that mother nature can be one temperamental beast, which makes deciding what to pack or even deciding the best time to go camping all the more difficult. To settle the debate, we asked our experts Four Hands in a Tin Can, RVEE There Yet, The Blonde Nomads, Touring Australia and Summit2Sea for some guidance. So which is better, winter or summer camping? 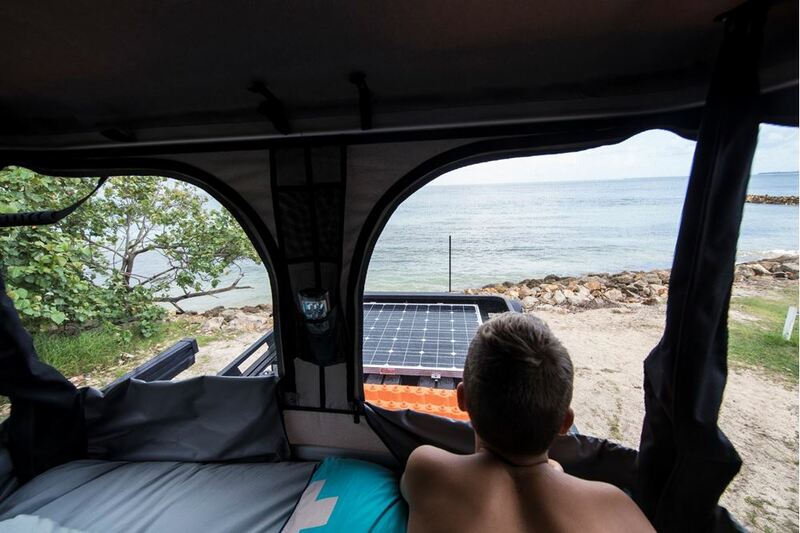 Summer camping for us is really no different than winter camping, except for the fact that we tend to enjoy coastal areas more in summer and inland towns such as Lightning Ridge and Broken Hill in winter. Summer camping means finding beaches, rivers and dams to camp by. We all love swimming, so these help us to keep cool. Diga Dog loves a good beach camp where he is allowed to run on the sand and paddle in the water. Summer camping also means looking for powered sites more often as the air-conditioning in the van is a godsend on those hot 40-degree days. We find that winter camping in the South means diesel heating in the van, and lots of layering of clothes, because the more we explore and walk, the warmer we get. We are experiencing winter in the west and north this year, and we are in shorts and t-shirts most days, but it is also windy in Western Australia at this time of the year. Apart from the cold, camping in winter means that our solar panels are not producing as much energy for our batteries as they would in summer. At times, this means we have to resort to using a generator to keep our batteries charged. That said, we've been travelling through winter these last three months and we have not had much trouble thanks to our Manager30 battery management system. We probably prefer travelling in the summer months, but we are yet to experience a long-term stay in the Tropical North during summer. We're going to give it a go and are looking forward to experiencing the build-up to the monsoon. In summer, we love to seek out the beach or a waterhole to cool down. We love the longer days and having to wear (and wash) fewer clothes. We have just tackled toilet training with Ziggy and it was definitely easier with warmer weather. To keep cool in the van we have 12V fans installed and if the temperature is too hot we seek out a powered camp spot, so we can run our aircon. When camping in winter we usually try to head North to warmer climates but there is something special about cosying up around a fire with a hot cuppa. As we are currently in the Top End of Australia it's definitely better to be here in winter as our days are warm and balmy so it's definitely a great winter destination. For us, it’s definitely the summer! It’s all about following the warmth as we move our way around Australia. It’s a great feeling being able to wake up each morning and know the sun will be out, the warmth is about, and no rain will be there to dampen the day (or very rarely). Getting out and going hiking, kayaking and swimming are things we really love doing and being able to do this in some of the most amazing places just wouldn’t be the same in wintertime, nor would we really want to. As the temperature changes, there are a lot of aspects that vary along the way. For example, summer brings the unwanted and annoying sand flies, march flies, humidity, and usually sleepless sweaty nights. In our opinion, winter brings clear skies, perfect campfire weather, cosy sleeping temperatures and generally all-round better weather conditions. Our favourite time to travel and camp is definitely winter! We love to be able to sit around a campfire at night and stare up at the clear skies to gaze at the stars. Also, for us sleeping is great! No one wants to wake up with the heat of the sun beaming through in the early hours of the morning. So it appears the jury is out on this one; summer camping definitely wins. Tells us below in the comments what your preference is. Can you really school kids on the road?